Have a happy Thanksgiving, one and all! 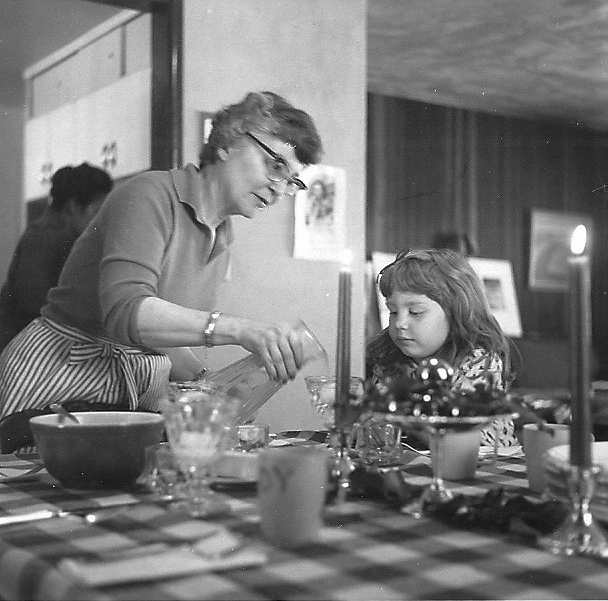 That’s me circa 1960, being served by my Aunt Flosh (Florence) White. My godmother and honorary “other aunt” Ruth Chin is in the background at the stove–she was the gourmet chef whose culinary successes informed and inspired us. She grew up under the tablecloths of her parents’ Chinese restaurant in Muncie, Indiana, and excelled at preparing Chinese dishes, but I’m inclined to think that here, she was involved in the preparation of a traditional Thanksgiving feast. My mother no doubt was behind the camera lens. We’re located at 107 Audubon Drive, Carmel, Indiana, and in the background you can see that rough redwood paneling in the living room that stabbed splinters into anyone who ventured too near. A picture is worth a thousand words–IF you know the story. Tomorrow is StoryCorps’ #TheGreatListen 2016, which competes with Black Friday shopping to remind us of the real point of life–not to collect stuff, but to share wisdom. Visit the site, download the app, record a loved one’s story, share with the world! You’ll be glad you did.